Maybe suggest to him to get a dirt bike and tear it up for awhile. After a few low speed dumps and near dumps which invariably happen he would lose the fear enough to get his confidence back. Stopping and waiting for the guy was a nice gesture, but I agree it gets old after a while. I don't know if I'm putting this right, but it almost sounds as if this guy is "forcing" himself. Some folks take to riding like Tiger to a 5 iron. Other's take to it like William Hung trying to sing the National Anthem. Buying a new bike with a 31" seat height when you're 5-6 is not a smart move. An old timer told me once, "Don't expect to be comfortable on your bike when it's moving if you're not comfortable at a stand-still." I think there's a lot of truth in that. As you know from us blogging back n forth, I've gone down before and been hurt. When I finally got the bike back out of the shop, I couldn't wait to get going again. There were no jitters. I don't want to make that sound like I'm full of myself, because I'm not. I can't really say why I had no jitters; I just didn't. I can guess that maybe the fact I really love to ride, and that I'm very comfortable on my bike, may have played some role. If that guy was a buddy of mine, I'd tell him straight out that him being on that bike is the same thing as rolling up 6" cuffs on his jeans. It doesn't fit. That in my mind is step one. Anyone can have some jitters I guess, but your friend's situation worries me. Any serious biker I've ever known loves to get into the twisties. Him saying he doesn't like them seems a bad sign. I hope he will realize he needs to get the bike that's right for him. I hope he can re-discover his confidence. If not, I hope he goes back to four wheels before he goes down again much harder. 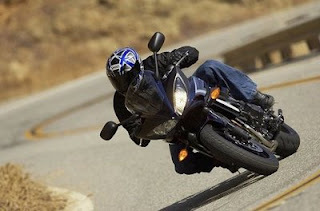 Better to admit to yourself that riding a motorcycle isn't for you than to be crippled or dead. I think this confidence problem stems from a bigger problem that's deeply rooted inside. It'll manifest itself in more ways than just riding a motorcycle. Perhaps confronting it head on, will help him in more ways that this. A lot of new riders are popping up out there. When you strike up a conversation with them, they typically suggest; "It is a blast" or... It is a bit nerve-racking but I think I'll get used to it. My response usually is: There are those who belong on a bike, and those who do not. If you find yourself mostly uncomfortable, you should probably reconsider riding a motorcycle. It isn't the talent or style of riding while things are going well, it is what you will likely do when trouble jumps up in front of you. Better to stay off a bike if your confidence (and preparation) isn't there. No arrogance or ill-will intended. I agree with all of these comments. I am a new rider and had a heart issue...literally almost died. I am fine now, but I haven't been on my bike in 6 months. I have lost all of my skills (new rider, first bike) that I have learned in my BRC. I bought a bike almost 1 year ago, and I am not ready to sell. I recently hooked up with a guy who is a biker and has offered to get me back on my bike and to coach me. He's the first to do this, and I hope he comes through. I do feel like I need some assistance. I am no way near ready for the highway. Wish me luck, this is my passion and I am not ready to throw in the towel. If I fail, at least I can look in the mirror and know it wasn't for me. Wish me luck. Ride safe!